In case you missed it, I’ve been writing about some easy, implementable tips to help you eat a little less— not because “eating less” is necessarily “healthy,” but because generally speaking, most of us are over-eating rather than under-eating. Check out parts 1 + 2 here, where we talked about boredom eating and emotional eating. THIS WEEK— we’re talking about portion control. I come in contact with way too many people who “eat healthy” but are seeing no physical progress. We have this idea that just because something is “healthy” we can eat loads of it and be okay. Yes, fruit is healthy, and so is quinoa and açaí and organic eggs and all that other trendy health food. But they still have calories! The portion problem is more than just “our portions are too large.” The deeper issue that we don’t even know what proper portions are. The truth is, unless you are weighing/measuring your food, you’re guessing at portion sizes. The other truth is: you do not need to weigh/measure every ounce you consume in order to see progress, however, I do highly encourage everyone to take the time to do so in the beginning of their journeys so they can educate themselves on what proper portions look like. There’s no doubt in my mind you will be both pleasantly and unpleasantly surprised how much 28g of shredded cheese is, what 2oz of deli-sliced turkey (the standard serving size) looks like, or how much hummus you’re eating when you actually measure out the 2TBS. So, tip number 1 here would be to measure, measure, measure. L E A R N what healthy portion sizes look like by taking the time be meticulous and careful on the front end so you don’t have to play the guessing game forever. Quit eating straight out of bags/containers. I’m not saying quit snacking on popcorn or pita chips. I’m saying quit doing it straight from the bag! Instead, pour out an honest portion (again, I recommend measuring to get the hang of it) into a bowl, put the bag up and walk away to enjoy your snack. This helps with two things: portion control (obviously) and mindless eating. When you’re intentional about making yourself a snack and heading to the porch or table to consume it, you’re eating on purpose and enjoying your food. You’re not just reaching your hand in the bag again and again and again while you munch through your daydreams. I love trail mix, but nuts + dried fruit with a little chocolate can get out of hand real fast in my house. I use the small snack-size ziplocs and scoop a handful of trail mix into each one so I know how much I’m eating and so I’m eating a finite amount. You can also do this with fruits + meats (like chicken sausage, deli meat, etc.) Even though these are all healthy snack options, you can easily overdo it on carbs and sugar for the day by eating a banana, 2 apples, some mandarins, etc. Cut up a few slices of what you like and keep it on hand in the fridge. Use the appetizer plates at restaurants. I used to never do this. I literally wondered why they even brought them when you had chips and salsa! However- this alone can change the game when you’re out to eat. Instead of just eating from the giant basket of chips, onion rings or popcorn shrimp (can you tell I’m hungry? )— put what you know you should be eating on a plate and eat just that. Boom. No questions asked or debates to be had. Take what you need/want and be done with it. Box up 1/2 your meal before you start. 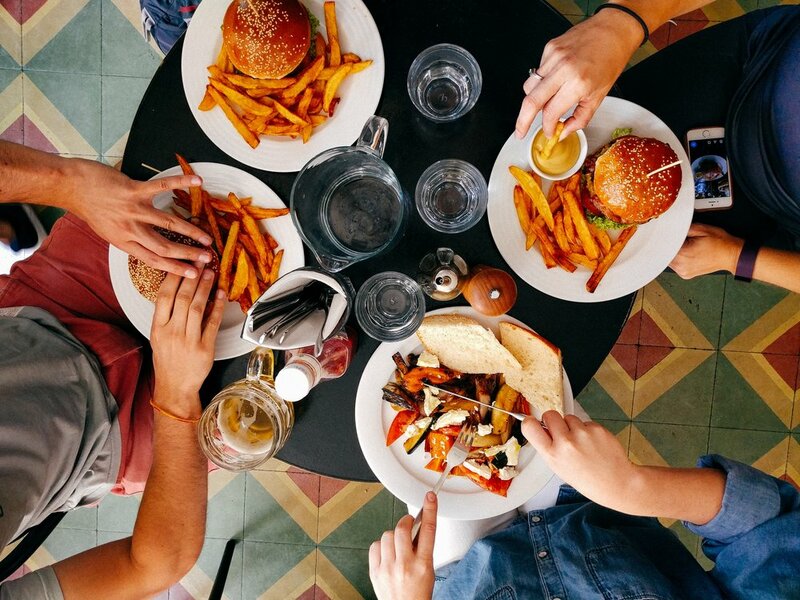 Now, this of course depends on what you’re eating and where you are as some restaurants have appropriate portions and others serve literally triple the recommended amount, so be mindful (and again— EDUCATE yourself!) but in general, this is a great, easy tip. Order what you want and enjoy your experience, but don’t make it all about the food! Ask for a to-go box when your meal arrives, scoop half into that and even if you don’t eat it, it helps to not have the option while you’re enjoying your meal. Most of us just eat what’s in front of us, so removing half of that is an easy, helpful move! Do you have any of your own portion control hacks? Is this something you struggle with or are surprised to learn could be an issue for you? REPLY to this email & let me know! REMINDER: if you’ve ever struggled to stay consistent in your health + fitness, I’ve got just the fix for ya. Check out my brand new free accountability program, designed to keep you on track to getting the results you want.